Ever wonder what’s going on inside a garbage disposal? This page offers an exploded-view illustration of a typical garbage disposal, along with a description of what the various parts do. A garbage disposal chews up food scraps that are fed down the drain with a heavy flow of water. 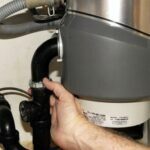 The disposal, mounted to the underside of the sink drain, has an electric motor that is either hardwired or plugged into a 120-volt box or receptacle, usually located at the back of the sink cabinet. Inside the garbage disposal in what is called the grinding chamber, shredding blades break down the food, and then an impeller arm and plate force the particles and liquid down the drain. Dishwasher drain water also runs through the garbage disposal so that any large particles are ground up before they reach the drainpipe. Two types of garbage disposal are commonly available: the continuous-feed type, activated by a switch as you run the water, and the batch-feed type, activated by turning a stopper after loading the disposal with garbage. 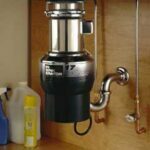 Most garbage disposals fit the standard drain outlet. Local safety codes may determine the distance the switch must be located from the sink—the farther away, the safer.